Choke is a valve which modifies the intake manifold pressure and thereby increase the amount of fuel in the air-fuel mixture. Choke is generally used in a naturally aspirated engine with carburetor. Choke is a butterfly valve that mounted on the inlet of air passage of carburetor (upstream from carburetor venturi tube). Normally choke will be in open position, in which valve is parallel to the air flow, and has no effect on the air flow. When choke is actuated by mechanical or by pneumatic method, it rotates an angle restrict the air flow (closed position). 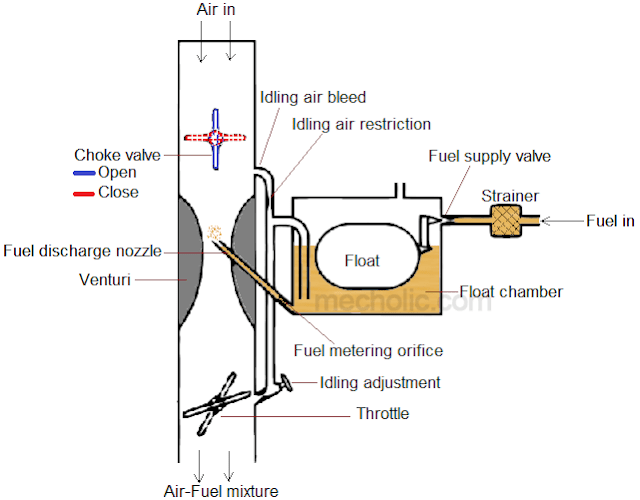 It reduces the amount of air flow to the cylinder and produces a higher partial vacuum, which increases fuel supply to the venturi throat from the float chamber (rich mixture). Choke has importance in a naturally aspirated gasoline engine. When the vehicle is kept stationary for a long time or in cold season, it may find difficulty in starting of the engine because gasoline droplet does not vaporize well in cold engine. In this situation in order to initiate and sustain combustion, the engine needs a rich mixture of charge. This can be achieved by closing the choke valve. Modern carburetors use spring-loaded type choke. It avoids the excessive choking after the engine is reached the desired speed otherwise the exhaust will contain a considerable amount of unburned fuel. Operation of choke made to automatic also by using thermostat so that choke closed when engine is cold and choke open when engine is warm.